(American, born 1952, Elizabeth, New Jersey, lives and works in New York) David Goerk received a BFA from Philadelphia College of Art, (1975) and his MFA from Indiana University, Bloomington (1977). He has exhibited in the United States and Europe. His work is included in many public and private collections—-including the Philadelphia Museum of Art, Rutgers University, Edward Albee Collection, Arcadia University and the Panza di Biumo Collection (Italy). 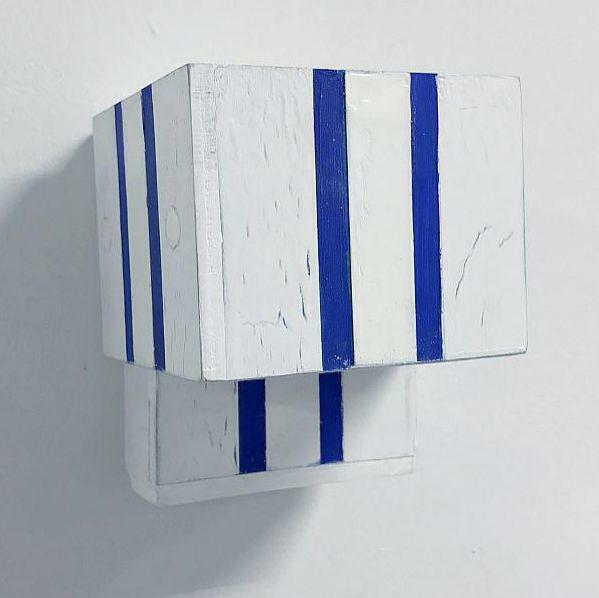 David Goerk's work reveals an ongoing exploration of the object and pictorial attitudes—and keeps painting and sculpture in dynamic equilibrium. He has continued to work distinctively and independently in this way, keeping a magnetic and mysterious quality within each work and within bodies of work. He maintains, at the same time, a purposeful reflection of--–and upon—-history; and the masters of modern and contemporary art whom he reveres. Over the years, he has used encaustic wax as both painting medium, and a sculptural element. He both brushes on and casts the wax, sometimes within the same piece. The support is wood, with gesso, enamel, encaustic, oil, and the occasional inclusion of other mediums. Painting and sculpture are not trying to be defined here; rather, the impulse is to make an object unto itself, with its own powers. The idea of painting and the act of painting, as well as the variability of viewpoint afforded in most sculpture, seem to be sifting through and forward, with process itself remaining quite clear. In fact, clarity itself may be the subject. New Objects. Larry Becker Contemporary Art, Philadelphia, PA Recent Works. Biennial ’89. Delaware Art Museum, Wilmington, DE Transmutations. Philomathean Society, University of Pennsylvania, Philadelphia. 14 at 55. 55 Mercer Street. New York, NY. Works on Paper. Beaver College Art Gallery. Glenside, PA Group Show. Neal Banezra, Chief Curator Hirshorn Museum and Sculpture Garden, Smithsonian Institute, Washington DC, Juror Biennial 93. Collaborations II. Selections from Philadelphia Print Studios. Small Paintings. Abington Art Center, Abington, PA.
Works on Paper. Beaver College Art Gallery, Glenside, PA.
Group Show. Ned Rifkin, Hirshorn Museum. Washington, DC. Philadelphia Drawing Competition. The Philadelphia Art Alliance. Philadelphia, PA.
April Kinsley, New York, Juror. Group Show. Judith Tannenbaum, I.C.A., PA.
60 Ninth Delaware Exhibition. Delaware Art Museum, Wilmington, DE. MEAT: Art at the Boiling Point. Philadelphia, PA.